Urban Stealth Uhaul Conversion: Box Truck Tiny House For Sale! This is Adam’s Urban Stealth Uhaul Conversion. 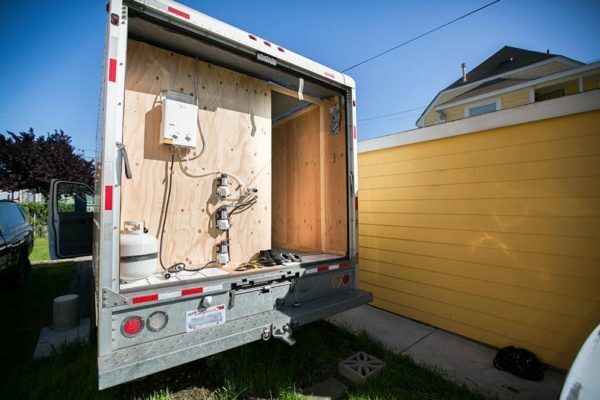 It’s a custom box truck in the San Francisco Bay Area that’s now for sale. Stealth Uhaul Box Truck Tiny House Conversion For Sale! Urban stealth Uhaul conversion that blends in like a moving box truck. Either boondocking or just parked in a commercial zone this micro-tiny house truck will keep you safe, warm, and dry. The interior is all ply-wood with recycled denim details, sink, shower, instant hot water heater, water tank, and grey water. The kitchen is minimal but has space to add burners if needed, raw vegan life kept that need down. The Thetford closet toilet has worked out wonderfully. The AIMS Power 5000w inverter will power a dyson vacuum to a the simple LED lighting system. For the chilli winters there is a ceramic wall heater that gets the place cooking. The motor has 103k on it with new front bumper, new tires, new transmission, and runs like a top. All service was done by Uhual up to the new tires and oil changes. I have used this truck during the week for two years and has saved me a ton on rent and the wide open road has been a nice escape on the weekends. It’s time to go smaller so “Ursula” is looking for her next dweller. Interested? Get in touch with Adam using the form below. Thanks!